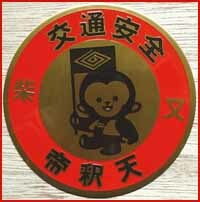 The monkey is one of the 12 zodiac animals of the Asian lunar calendar. It is the messenger of the deity Sanno Gongen 山王権現 and sometimes seen as a deity itself, protecting people from harm and bringing good health to the children. the monkey comes as a papermachee doll, clay doll or clay bell and from other materials. MASARU 神猿 (lit. Kami Monkey). The sacred monkey of the Hie Shrine (aka Hie Jinja 日吉神社, Hiyoshi Taisha 日吉大社). Masaru is considered a demon queller par excellence (魔が去る・何よりも勝る). Masaru is also invoked in Kōshin rituals to stop the three worms from escaping the body. . .
SANNŌ (SANNO, SANNOU) GONGEN 山王権現. Literally "Mountain King Avatar." Sannō means mountain king, and gongen means avatar. 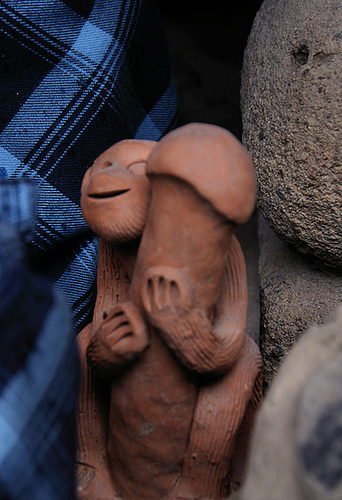 The monkey is Sannō's messenger (tsukai 使い) and Sannō's avatar (gongen). 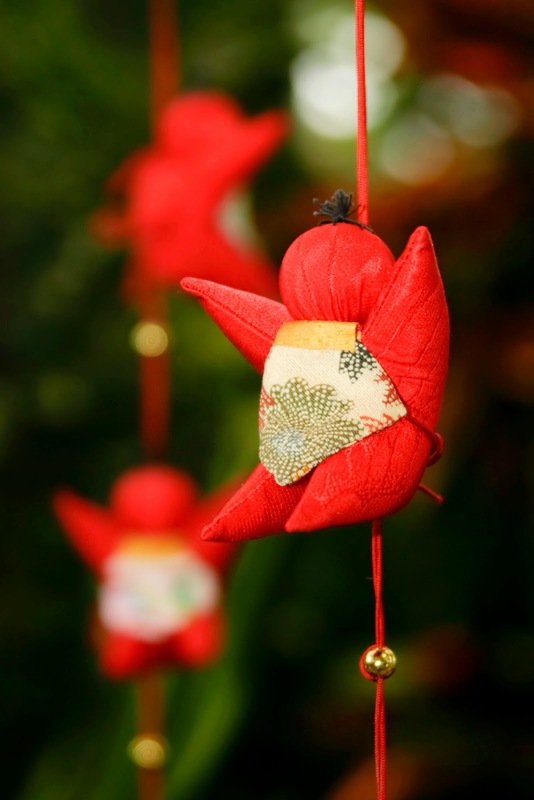 At Hie Jinja shrines in Japan, the monkey also acts as the patron of safe childbirth and harmonious marriage, and red monkey charms are used to ward off evil and disease . . .
SARUGAMI 猿神 (lit. Monkey Kami). 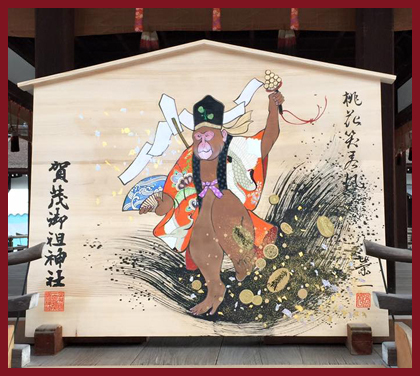 Another term for the sacred Shintō monkey (Masaru) of Mt. Hie. Sarugami is worshipped as the deity of easy delivery and child rearing, and is the Lord of the three monkeys (see, hear, speak no evil). Closely associated with fertility . . . The tutelary deity of Juuzenji Shrine, one of the 21 Sannō shrines at Mt. Hiei (Hieizan 比叡山). Juuzenji's emissaries are monkeys. more details Details below. SHINRA MYŌJIN (SHINRA MYOJIN) 新羅明神. In addition to the central mountain deity named SANNŌ, the Tendai shrine-temple multiplex located at Mt. Hiei is home to another powerful mountain deity. 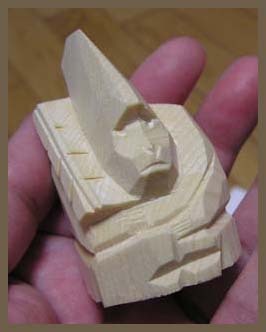 This latter deity is known as Shinra Myoujin (also called Shiragi Myōjuin). Artwork of this deity typically shows an unusual crown which has three points, in the traditional shape of a mountain. Related also to Daruma, the patriarch of Zen Buddhism . . .
猿田彦, 猿田彦神. Commonly translated as "monkey man." The long-nosed Shintō deity of the crossroads who takes on the visage of a monkey; also considered by some to be the ancestor of the long-nosed Tengu mountain goblin. 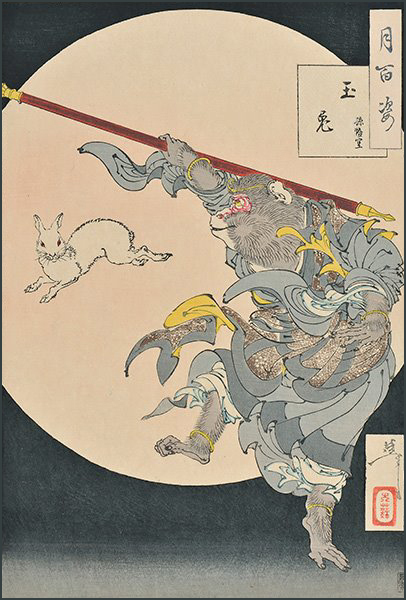 This kami is often depicted as a disheveled wanderer, and is said to protect people in the course of their lives and to ward off bad influences. Sarutahiko's connection with Kōshin 庚申 rituals and three-monkey worship did not occur until the Edo period . . . In Japan, certain Zodiac days/years of great misfortune are known as Kōshin 庚申 (Ch: keng-shen or geng-shen). 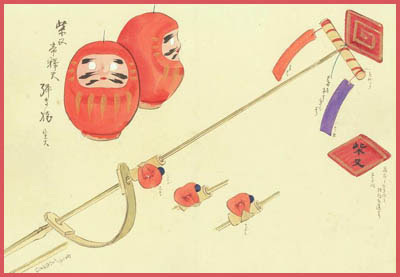 On these days (year), special rites -- influenced greatly by Chinese Taoist rites involving three worms and nine parasites that inhabit the body -- are performed to ward off evil influences, to protect against sickness and misfortune, and to cure illness.
. 猿田彦 Sarutahiko, Tengu and Fudo Myo-O . and Sarugami 猿神 the Monkey deity .
. Monkey Daruma 「申 だるま」 .
. saru no nenbutsu 猿の念仏 .
. sarumatsuri, saru matsuri 申祭（さるまつり）monkey festival .
. Hie Jinja sairei 日枝神社祭礼 .
. sarumawashi 猿廻し (さるまわし) monkey dance performance . May all the bad influence (catastrophies, illness ...) go away (saru　去る) is the wish for a healthy life of the child.
. . . CLICK here for 申 Photos !
. Nakayama dorei 土鈴 clay bells from Nakayama . featuring the famous Monkey Son Goku 孫悟空, who travelled to China to obtain Buddhist sutras.
. saru bobo 猿ぼぼ / saru baba ... "monkey grandmother doll"
toys from Kagoshima shrine : hajiki saru はじき猿 "flicking monkey"
. Konoha saru 木の葉猿 monkey from Konoha .
. 九千坊 Kyusenbo - leader of the Kappa clan . also made in Kuwana, Mie 桑名市. Made with a spring from bamboo. 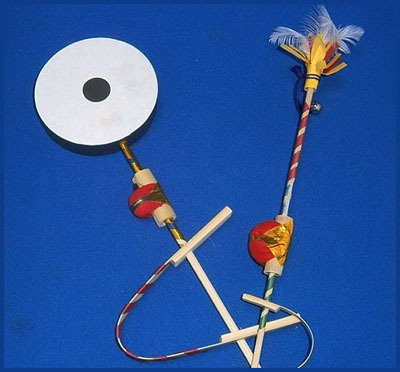 The top decoration can vary, with feathers, a drum, a sun symbol, a bell or others. In 多度町 Tado village, a round drum is on the top. 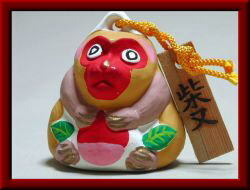 The monkey from Matsuzaka 岡寺観音 from the Kannon Temple 岡寺 Okadera is sold as an amulet during the festival of hatsu-uma 初午, the first day of the horse. 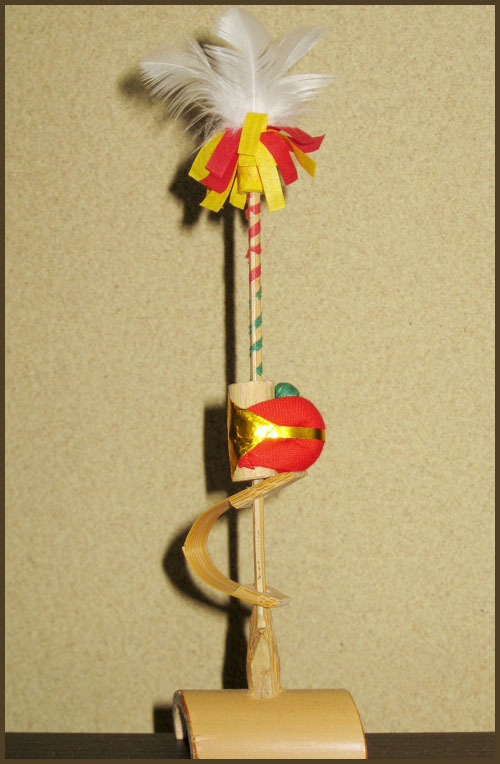 Some sticks can be as long as one meter.
. hajiki saru, hikisaru 弾き猿 "the repelled monkey" .
. noborizaru のぼりざる monkey climbing a pole .
. tori daki saru　鶏抱き猿 monkey embracing a rooster .
. Migawari-zaru Monkeys 身代わり猿 .
. kumisaru, kumi saru 組み猿 monkey combinations .
. O-Saru Sama お猿様 Honoarble Mister Monkey .
. Hiyoshi jinja no 日吉神社の神猿 monkey deity . 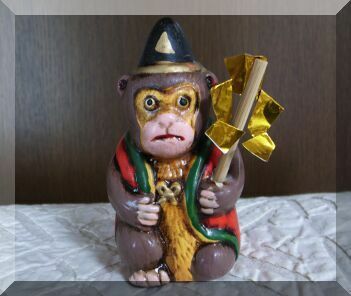 hajiki saru はじき猿 "flicking monkey"
This monkey will "flick away evil influences from you" (yakubarai). It is sold at various stalls along to the temple.
. Shibamata Taishaku Ten 柴又帝釈天 . . . sanen 三猿 three wise monkeys . The main character in the classical Chinese epic novel Journey to the West (Saiyuki, 西遊記; Saiyuuki). In the novel, he is a monkey born from a stone who acquires supernatural powers through Taoist practices. After rebelling against heaven and being imprisoned under a mountain by the Buddha, he later accompanies the monk Xuanzang on a journey to retrieve Buddhist sutras from India. Heroes from the "Journey to the West"
This was one title used for a popular, abridged translation by Arthur Waley.
. Monkey Heroes on Stamps .
. The three wise monkeys .
. kooshin shinkoo　庚申信仰　ka no e saru - Koshin Shinko belief . ema votive tablet from shrine 幸神乃社 Sainokami, Kyoto. 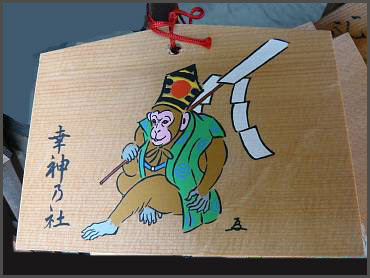 The monkey wears an eboshi hat and carries a ritual wand. 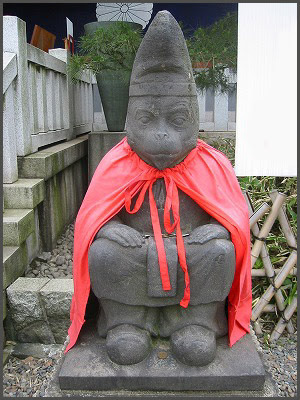 A nobleman's headgear on a monkey - a proverb in Japan. Do not try to be more than you are. Otherwise you only make a fool of yourself.
. Eboshi 烏帽子 formal court hat. pick each other’s fleas . . .
. WKD : Gods are absent (kami no rusu 神の留守) .